The Call Flow diagram shows each call's journey from the time it enters the contact center until the time the call is terminated. The event information is represented by Icons. 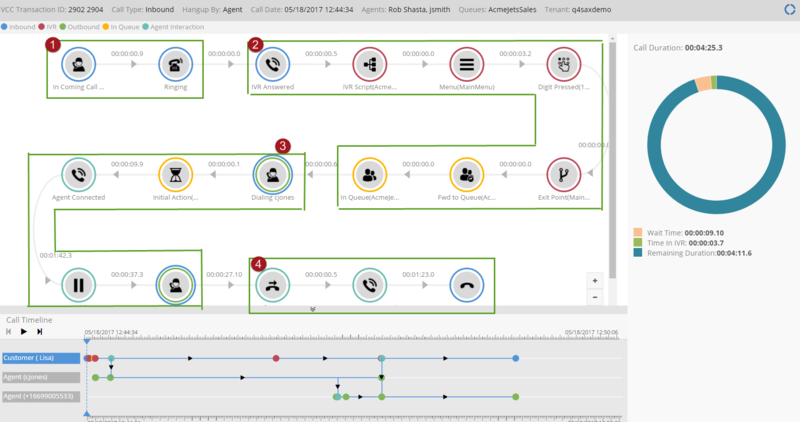 Call flow also tracks multiple call legs in the customer experience. Multiple transaction IDs displayed for a single interaction means that the customer call was involved in multiple legs of communications. This may include multiple agents or queues along the call path. 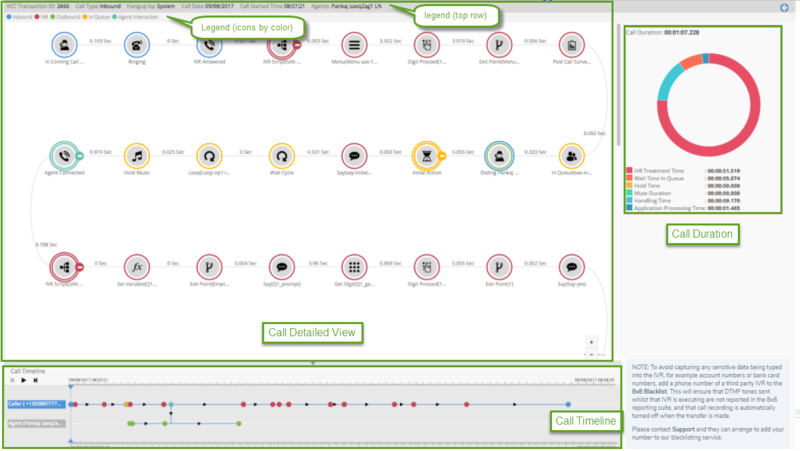 Call Detailed View: Presents the end-to-end customer interaction, a detailed call analysis of a customer call going through different phases such as: the time an inbound call comes into the system and answered by Virtual Contact Center, the time the IVR script is applied to the call, when the call is forwarded to a queue, and the amount of time the call spends in the queue until the call is terminated. You can collapse or expand the IVR events by clicking + or - next to the IVR icon. Collapsing the IVR events allows the call center managers to focus more on an agent's call interactions in a call flow. Call Timeline: Is an interaction recording presenting a linear view of the call journey. When you Play the timeline recording, it highlights the IVR events depicted by call flow icons in the order the call was processed through the system. 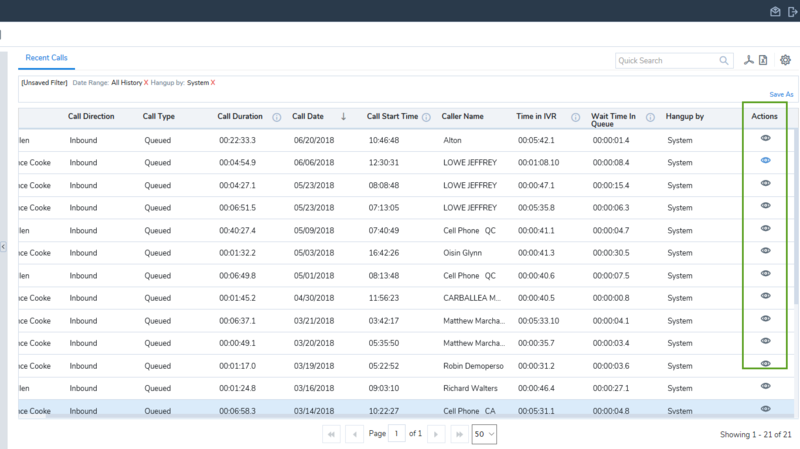 Individual timeline rows are displayed for agents and the caller on separate lines as well as for the inbound leg, agent leg, and customer leg of the calls. Note: The Play button in Call Timeline, moves through the interactions that are taking place. To hear the call voice recording go to Monitoring > Playback. Call Duration: The Call Duration shows a pie chart with duration time data for the call being viewed. The Call Flow pie chart shows a call's time break-down. The pie chart is read clockwise, and follows the coloring of the legend: IVR Treatment Time, Wait Time in QueueA queue is an ordered collection of interactions waiting to be served by agents qualified to respond to these interactions. In addition to enabling the call center administrator to customize how incoming interactions are prioritized and routed, queues also ensure that interactions are never lost or discarded., Hold time, Mute Duration, Handling Time, and Application Processing Time. The Application Processing Time is the total time of a call minus other times spent for IVR treatment, wait time in queue, etc. during a call. VCC Transaction ID Indicates the unique ID for each leg of the call. A Virtual Contact Center Transaction ID is assigned to each interaction that enters Virtual Contact Center. For example, two transaction IDs indicates the call has been transferred. Call Direction Indicates if the call is an inbound or outbound call. Hangup By Indicates if the call is ended by the agent, customer, or system. Call Date Lists the date of the call in MM/DD/YYYY format. Call Start Time Lists the start time of the call in HH:MM:SS format. Agents Lists the name of the agents that handled the calls. TenantYour unique and secure contact center instance running on a 8x8 platform. You use the Configuration Manager to create and configure all aspects of your contact center's resources and operational behaviors, including groups, incoming channels, queues, agents, routing scripts, skills, monitoring, recording, and reporting. Presents the name of your tenant. The following table shows different groups of icons in a Call Flow, designated by colors. Each icon represents an event or activity that is taking place during the call. Hover over or click each icon to see an information box. The IVR events can be collapsed and expanded by clicking + or - next to the icon. In long calls, it helps focus on agent call interactions. Indicates incoming calls, when the call is ringing, and when the call is answered. Indicates IVR script events such as forward to queue, say, or get digit, schedule, open, closed. You can collapse or expand the IVR events by clicking + or - next to the IVR icon. It helps focus on agent call interactions. Indicates outbound events, such as dialing an external number, Queued call back or a Post Call Survey call back. Indicates the duration of time the call waited in queue. Indicates the actions and events handled by the agent. Click next to the desired call record, or double-click a call row to launch and display the Call Flow diagram. In the following example, the call flow presents a simple call coming to the queue, answered by the first agent and transferred to the second agent in the same queue. The call comes in to Virtual Contact Center. The call is treated with an IVR and the caller selects an option from the IVR menu. The call is then forwarded to a queue. The call is offered to an agent; the agent's workplace phone number is being dialed. The agent accepts the call to connect with the caller. The agent transfers the call to the second agent. Click in Call Timeline to track the call journey. The tracker takes you to every second of the call highlighting the event. Click to show and hide Call Duration details. Click to close the Call Flow browser window. Click to log out of the Customer Experience application.